Comprehensive classroom activities and lessons all in one convenient package. 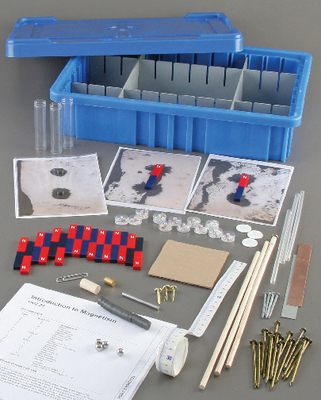 Address all the facets of physical science with Investigating Physical Science Kits. These innovative packages include apparatus and activities to fully explore a key physical science topic with an entire class of 30 students. Set up multiple stations, each with its own apparatus and accompanying experiment. Students travel from station to station in groups, applying the knowledge learned at previous stations to their following activities. Each of the experiments addresses a different aspect of the same physical science concept, so upon completion students have concrete, hands-on experience and complete understanding. A detailed activity guide provides instructions for each station experiment, and an included quick-start guide simplifies initial setup. And for your convenience, a durable storage system keeps all the apparatus, guides, and materials organized for repeat use. The stackable tote can be stored compactly with all other Investigating Physical Science Kits for a complete curriculum of activities. Actually see how magnetic fields interact with each other using the magnets and materials provided in this comprehensive investigation of magnetism. Students complete all lab activities and learn how to draw and map a magnetic field, learn what sticks to a magnet, and discover magnetic strength. A plastic sleeve contains iron filings, for easily visualized magnetic fields without the messy clean up, and a compass is used to accurately map the magnetic field around a bar magnet.